Video analytics firm TubeMogul is launching a video ad network. The company’s pitch to advertisers: “Our data allows us to know what videos are likeliest to be watched,” says CEO Brett Wilson. The ads will be standalone ads on social networks like Facebook games and apps. 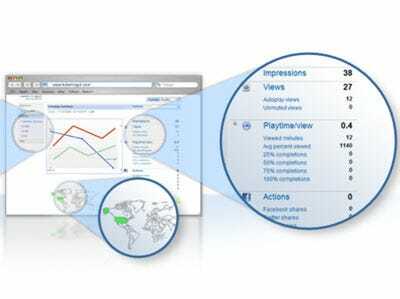 It will also work with top ranked comScore sites. TubeMogul has been testing the service, and Brett says advertisers are getting video view increases of 200-400% and viewing time increases of 30%. TubeMogul says it will be 100% transparent, offering massive amounts of data about when videos are viewed and initiated. Where the video ads are on the page, above the fold or below. The private beta of the ad network topped 21,622,131 views, says Marketing Director David Burch. Kmart, Unilever, Nestle, 21st-Century Fox, JCPenney all participated. The goal is to offer a full self-service video ad platform down the road. Advertisers would be able to log into the system, pick where their ad goes and set it all up.